Scotty McCreery rode his 2011 "American Idol" win to a platinum album and several new artist awards. With his second album, "See You Tonight," McCreery says his career is now in his hands alone. "We have been off the show for 2 1/2 years," the 20-year-old said. "The wave pretty much has to be my wave now. We have to make our own momentum. That comes with success, with radio success, but you've also got to make the good music first, the good songs for that to happen." In McCreery's case, `Idol' was a platform and not a career. He believes this album and its success at country radio is a big factor in his transition from a TV star to a country star. The songs on "See You Tonight," released on Tuesday, stay true to McCreery's values and his love of traditional country, but he also expands his sound and even riffs on country radio's current infatuation with songs about trucks and beer. Album producer Frank Rogers, who has worked with Darius Rucker and Brad Paisley, said McCreery's musical influences, like a lot of younger music fans, are not just traditional country and that is reflected in the new album. "He's also a college kid who has a very diverse iPod and playlist," Rogers said. "I don't think anything is forced in there, but we brought in some musical elements, things that that maybe he hasn't put on a record before, but they are part of his musical vocabulary." The title track is a catchy love song that he hints may be inspired by his own love life. "Didn't just come out of thin air," he notes with a smile. The album also features some of his original songwriting for the first time, an aspect that made the soft-spoken McCreery somewhat nervous. "At first you're a little scared to come out of your shoes and share some of your thoughts," he said. "You have to share those intimate thoughts to get a really good song." Although he is still is a young writer, he wanted to add some more depth to the emotions on his album by adding a few more songs about heartbreak and love. "On the first record, everything was happy-go-lucky in the world," he said. "We know that's not true. We have a couple of songs on there that make you think, that are a little deeper about relationships." And his best sounding board for his new album turned out to be his college roommates at North Carolina State, where he is a sophomore trying to lead a fairly normal life outside of Nashville. "They shoot it straight with me," McCreery said. "I call them my biggest haters." Their verdict? "They have been loving this record." Today's the day! 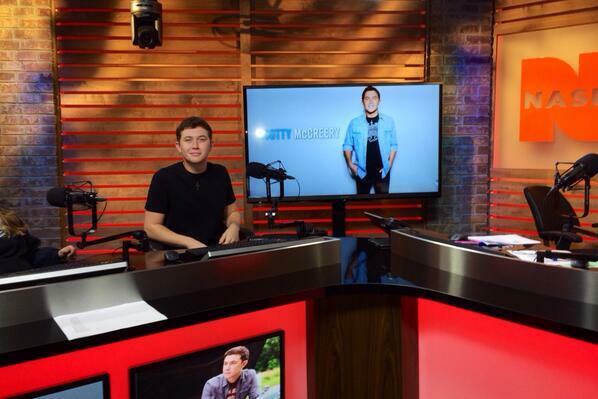 @ScottyMcCreery will be co-hosting the show with us from 8-10 AM EDT! You can listen in on @NASHFM947NY! Getting excited for tomr morning on @AmericasMorning Show. You ready @GettinSweenered, @chuckwicksmusic, and @blairgarner?